I’ve been hearing a lot lately about the lack of snow at the Vancouver 2010 Winter Olympic Games, with many asking themselves where on earth the snow disappeared to. Well, I know where it went…and that’s right here, in Esbjerg! Under the circumstances, there was only one thing to do, and that was to take a vacation. What’s that you say? You suggest Cancun? Santorini? Or Eilat? Ohhh, the diving in beautiful is Eilat. Ppppffffff, no! This is not good enough for Jens’s core of super trained divers. Destination of choice: Hemmoor, Germany! (Look it up on a map, it took us forever to find it to). This trip coincided perfectly with the arrival on the newest member of the Maritime Archaeology Programme; a new van named ‘Big Blue’. This new vehicle, along with ‘Wee Blue’ was our ticket to paradise, bright and early on the Monday morning. At least, that was our plan, until ‘Wee Blue’ got jealous of the new van half way to Hemmoor and broke down, leaving half the team stranded in the dark corners of industrial Hamburg (it’s ok, we found entertainment), while the other half made it safely to destination to indulge in food, beverages and joy riding. In the end though (that is to say 4-5 hours wait), ‘Wee Blue’ was no match for Jens ‘It drives like a tank’ Auer, and the two groups were reunited in Hemmoor to start a week of intensive training. Officially, the training week did not start until Day 2 (Tuesday), even though two divers went in on Monday evening, and quickly found themselves enjoying a moonlight dive with flooded flashlights (and there was no moon either). 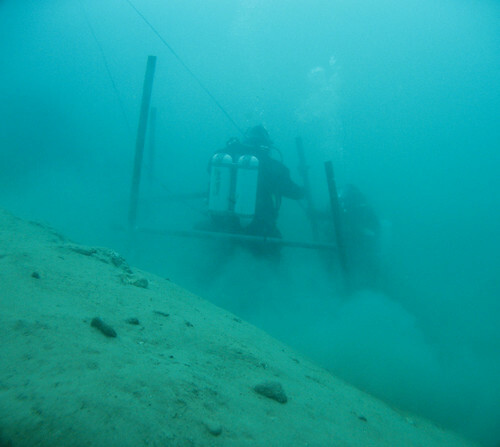 When training started, the students were divided into two separate groups, surrounded by two assistants each, and had to accomplish a series of underwater tasks. From Tuesday to Friday, the students never ceased to amaze Jens with their sheer determination and know-how. Imagine the look on his face when he found his students to be skilled underwater carpenters (Underwater Light Construction Exercise). He is now even considering utilizing a scaffold in this summer’s field school in Germany after seeing how quickly and efficiently the students build-up a frame (Underwater Heavy Construction and Lifting Exercise). This week was also the opportunity for Jens to discover that his students were the next Alfred Eisenstaedt and James Cameron (Underwater Photography and Videography), and for the students to practice their core archaeology skills (Underwater Drawing/Recording and Measuring). The crowning achievement of the week, and the moment most students had been waiting for, was the Deep Dive to 30m. This was to take place on a free diving platform located at the center of the lake. After redefining the term ‘poop-deck’, and enjoying an improvised canoe trip along with a light jog with the deep-sets by the first group, students went down to 30m in pairs to experience the abyss (Note: if you ever hear your mother calling you to clean your room at 30m, you’re probably mildly suffering from narcosis). Even though the training week was intense and demanding, Jens did find it in his heart to give us a little free time. It is in those few moments that we discovered the joys of Master Crumble (Thank you Jens, my life will never be the same). Some found entertainment in reinventing their looks (Sideburns and Mustache: 0; Jason: 1), while others dreamed of fame, honour and women (Spartacuuusssss!!). This stress-free and relaxing training week would not have been complete without Jens’s ultimate test, which consisted of braving a massive blizzard in order to find our way home. In the end (that is 10-11 hours later), we made it home, happily saying that we survived He(ll)mmoor. 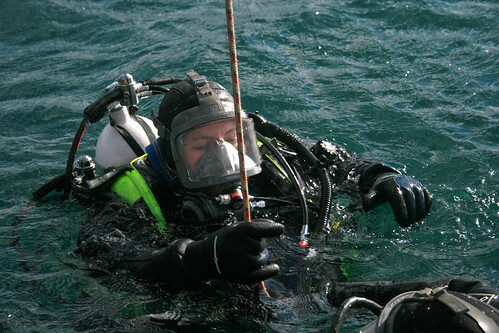 The diving team (participants in the commercial diving course) of the first year students in the Maritime Archaeology Masters Programme had the first diver training week in Hemmoor Lake. It was the best team-building event ever! Yes, it was a little bit cold, and of course a little bit tiresome…But we enjoyed every minute! Everything is exciting when it is the first time. Dry suit, tethered or untethered diving, orientation by using compass, rescue drills, lifting objects with lifting bags, constructing a frame underwater… And if you have the strength to continue with the night dive, the universe rewards you with a full moon!!! Communication between divers and surface was amazing, learning new vocabulary, use short and clear sentences. The most important was, that day by day we started to realize that no matter what role one has in the team (diver, stand-by diver, tender or supervisor) the key word is RESPONSIBILITY. I suppose that this way and step by step we will become professionals, hopefully! And somewhere between good food, philosophical discussions and environmental awareness we started to realize what being an international master student is all about. Germany is from now on our favorite country, where everything is so cheap and there are sunny moments! On Friday we visited the Deutsches Schiffahrtsmuseum, which was also very interesting. Marja and Christian thank you for your help and support, und Vielen Dank an unseren Professor Jens.